Although Australian Merino sheep derive their name and basic appearance from the Spanish merino breed, they are a distinct breed in their own right. They have been developed and adapted in Australia to the specific conditions of this country. More than 80 percent of all Australian sheep are pure Merino, with most of the remainder at least part Merino blood. Merino is grown primarily for its heavy fleeces of fine wool. Merino sheep were brought to Australia from the Cape Colony, England, Saxony (South East Germany), France, and America. The Australian Merino is not a single homogenous breed but a number of strains of sheep all of which, regardless of their origins, are uniquely Australian. The major factor determining the Merino’s development has been the requirement for environmental suitability. 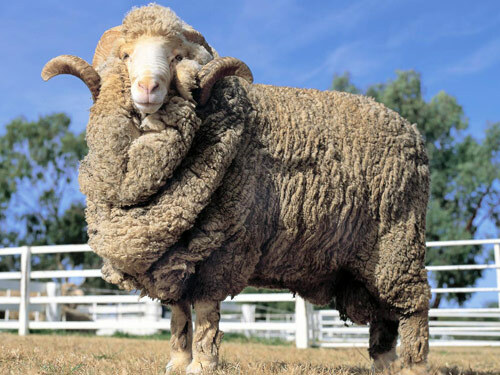 The four basic strains of Australian Merino are Peppin, Saxon, South Australian, and Spanish. The Peppin Merino is suited to the harsher conditions of inland Australia. Its heavy fleece falls in the mid-range of Merino wool qualities. As many as 70 percent of today's Australian Merinos are said to be directly descended from the Peppin-developed sheep. The South Australian Merino is suited to semi-arid conditions of 250 mm (10 in.) of rain or less and is found in South Australia, Western Australia, Queensland and New South Wales. The wool from these sheep is at the strongest (i.e. thickest in fiber diameter) end of the range of Merino wool types. The Saxon Merino is without peer in the quality of wool produced. It is best suited to cool to warm conditions with 500 mm (20 in.) or more of rainfall and is found in the highlands of Tasmania, the cooler areas of Victoria, and the tablelands of New South Wales. Though relatively few in number, there is a distinct strain of the Australian Merino that is directly descended from Merino sheep of "Spanish" blood imported into the colony. The development of the Australian Poll Merino is relatively new. Polled rams have been selected and mated to Merino ewes and selection continued for the quality of pollness. The result is a pure Merino without horns.The Fonthill Merino was developed in the 1950's by crossing American-bred Rambouillet-Merino rams with a fine-wool Saxon strain of Merino. The second most populous breed of sheep in Australia is the ewe progeny from Border Leicester rams mated to Merino ewes: the "Border/Merino."